The village of Sandhurst is in Kent near the border with East Sussex. It is situated very close to Bodiam. It is located on the A268 near the villages of Hawkhurst and Northiam. Sandhurst is in the borough of Tunbridge Wells. I have been trying to get into this tea room for over a year now. It is not open on Wednesday and closes at certain periods during the year. I was driving on my own to Hastings and the road was closed and traffic was being redirected. This took me through Sandhurst on one Wednesday afternoon, and the owner decided to open and take advantage of the increased passing traffic! I entered the tea room at 14.10 hrs and as expected, it is an immaculate tea room. I wondered whether the food and tea would be to the same high standard and I am delighted to report that it was. I had a prawn jacket potato, followed by a toasted tea cake and a pot of Assam tea. The usual tea room menu was offered as well as crumpets and breakfast until 2pm. At weekends, lunches are the main theme and people from the area advised to book in advance. Tables are covered with red and cream table cloths, lovely cream leather chairs with matching carpets and lovely old oak beams, with low ceilings. It was pleasant to hear an old chime clock in the background. There was a lovely glass cake display on a lovely cabinet and the lovely glass frontage to the tea room made the tea room light and airy. Teas offered were; Earl grey, Assam, Darjeeling and a selection of fruits teas. There is also coffee, hot chocolate and a selection of cold drinks. I was not the only first timer to this tea room. Others came as they were driving past and all I could hear were constant compliments to this little, quaint tea room. I met the owner and we had a lovely discussion about English tea rooms. 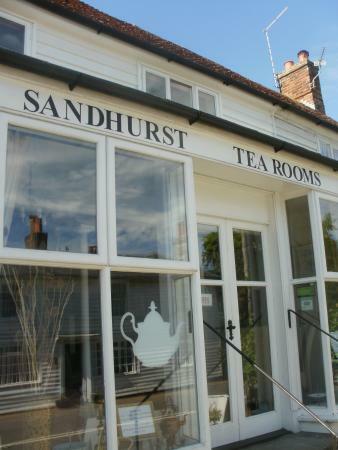 I can highly recommend the Sandhurst Tea Rooms. Parking is available on-site and you will not be disappointed. As for myself?....can't wait to return.